Humor: A Vote For Iris Steensma Might Start Some More Fireworks | "DESTROY ALL FANBOYS!" Granted, it’s never (ever!) going to happen unless the stars are in order (on a few fronts, ha and ha-ha) and some other key people think it’s a good idea. It’s not (at all), but Hollywood has done far worse updates of other films (for better or worse… mostly worse in my opinion). Nevertheless, I’m getting this silliness off my chest and out of my head so I can clear up space in the grey matter filing cabinet. Without giving the store away (he said, vaguely), let’s just imagine an older, wiser Iris Steensma (someone get Jodie Foster on the phone, please? Thanks.) now planning a run for office and like (too) many politicians, has written a tell-all autobiography to counter some of the things said about her by the opposition. Digging up the past means reaching out (or having someone reach out) to certain people for permission to use their names and or images, but Travis was nowhere to be found (and isn’t mentioned by name in her book). Mr. B’s last known location (somewhere in lower Manhattan) has been gentrified with him getting the boot out of the area (probably to a friend’s place), he hasn’t been driving a cab for some time (since a little accident cost him his job), but he’s still alive and kicking and keeping a daily journal. Mentally, he’s still an odd bird, but has forgotten about Iris until he sees her doing a TV interview about the book, which he tracks down and reads. Let’s just say things get really interesting from that point onward. Yes, it’s a lousy idea (you should hear the rest of it, but it’ll cost you a few grand) and nope, I’m not even going to mention the two trailers and poster concepts I’d thought up way back in the late 90’s. Still, I feel better about letting that cat out of its particular bag. Now I have more room for thinking up how to get Firefly back on the airwaves in some way, shape or form that makes sense. Or perhaps I’ll just sleep better at night until I find out someone took my dopey idea and ran with it, scissors in hand right to their agent. 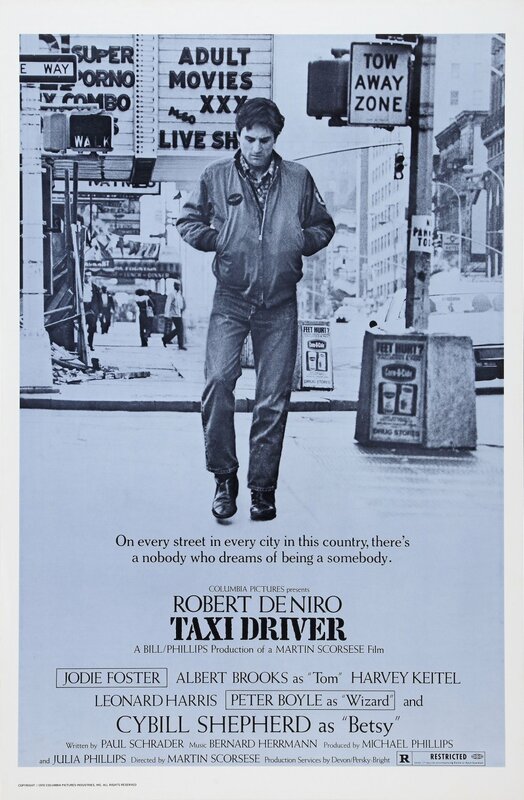 This entry was posted in 2016, Commentary, DAF, Features, Humor, Movie Posters, Updates and tagged 1976, Bad Ideas, Classic Film, Comedy Gold, Movies, Nostalgia, NYC, Sequels, Taxi Driver by geelw. Bookmark the permalink.